Good morning. It’s fifth week. At a Phoenix Survivors Alliance (PSA) protest yesterday, 25 people gatheredoutside of Cobb Gate to call for the University to reform its disciplinary policies regarding gender-based harassment, discrimination, and sexual misconduct. — A protest earlier this week organized by another group, where students sat in on his Booth class and silently held up signs with messages such as “Rigorous Inquiry ≠ Hate,” resulted in Booth professor Luigi Zingales—who had invited Bannon—agreeing to attend a town hall that would allow members of the University to express their concerns about the planned event. An updated proposal merging the Jackson Park and South Shore Park golf courses estimates costs to be $30 million, the Hyde Park Herald reports. A public meeting was held to discuss the designs, which have drawn public criticism for safety and accessibility concerns. — A park district official maintained that the rates will stay consistent with the market rate and under $50 for Chicago residents to use the renovated course. Rates are currently around $30. 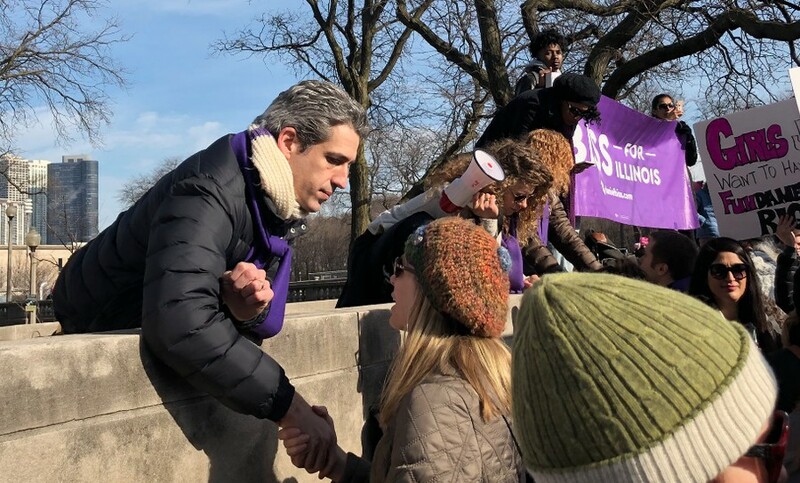 Daniel Biss on campus today: The Illinois democratic candidate for governor and former University of Chicago mathematics professor will speak at 4 p.m. in the Bartlett Trophy Lounge as part of his “Road Forward University and College Tour.” The event comes when the most recent poll indicates that Biss is in second place behind frontrunner J.B. Pritzker in the race for the Democratic nomination. — Several students argued that although efforts have been made to incorporate female writers and writers of color, these authors are often relegated to secondary status within syllabi. “We don’t need Media Aesthetics to be built around [German cultural critic Walter] Benjamin,” one student said. We interviewed professor Geoffrey Stone on our podcast to discuss free speech in the context of the planned Bannon debate. Subscribe here. The Misanthrope was a dazzling production, belying the fact that Exquisite Pressure gives students and professional directors only 30 hours to rehearse and put on a play. UBallet’s Cinderella gave new and experienced ballerinas alike the chance to experience the magic of storytelling and dance. Michigan-based Børns, alongside strong openers Mikky Ekko and Charlotte Cardin, took the Riviera by storm last Saturday. The new Migos album is nearly 100 minutes long, affirming its members as three of Atlanta’s rap kings; yet “Culture II” still leaves much to be desired. The swimming team dives in deep this weekend for their meet. Both men's and women's basketball host their road foes from last weekend. Track and field gears up to host the Windy City Invitational. Wrestlinggets one more meet before the UAA Championship. Disagreeing with other contributors who were more critical of the decision to invite Bannon to campus, contributor Patrick Hanley argues that letting Bannon speak is the only way to expose his bigotry. Columnist Dylan Stafford contends that modern masculinity encourages men to hold misogynist and homophobic beliefs. Contributor Margaret Gadek argues that campus volunteering efforts, while imperfect, deserve praise rather than scrutiny. After being shot and wounded Tuesday evening by what she thought was a BB gun, a 28-year-old woman was told when she decided to go to the hospital that she had actually suffered a gunshot wound. The Doomsday Clock moves from two-and-a-half minutes to two, symbolically signifying the world’s rising vulnerability to nuclear risk, climate change, and disruptive technologies. Now, the clock is at its closest to midnight since 1953—during the height of the Cold War. A new UChicago Charter School opened on East 63rd Street in Woodlawn on January 11. The new building will serve nearly 650 students, ranging from grades 6–12, and will feature a new college center to encourage timely graduation and college engagement. Correction: The newsletter for January 26 originally incorrectly said that the University would charge tuition to students enrolling from Puerto Rico. Their tuition will be waived as part of a broader program of financial support, including health insurance, Puerto Rico to Chicago airfare, and a stipend. We regret the error.